This action enables you to compile Microsoft C# Projects (.csproj) produced by Visual Studio.NET without having Visual Studio installed on your build machine. Note that this action is only for Visual Studio.NET 2003 and earlier, and/or .NET Framework 1.1 and earlier. To build C# projects from newer versions of Visual Studio / .NET Framework, use the MSBuild Project action. Select the .csproj file to build. Specify optional additional search paths for .NET assemblies. Click the folder button to display a list dialog with all search paths. Only required if building with the .NET Compact Framework. 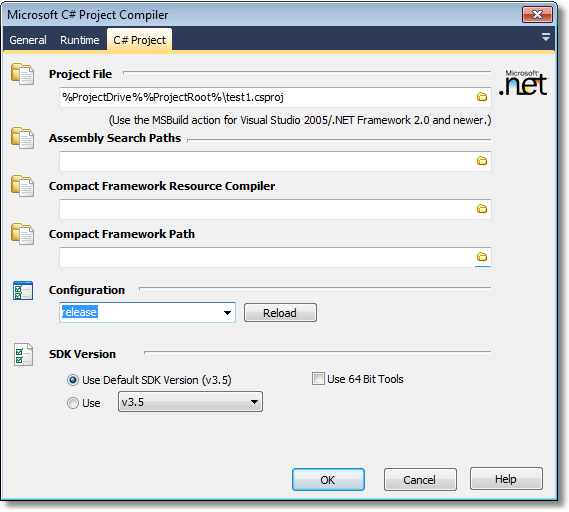 Select a resource compiler and framework path for the required version of .NET CF. Choose the Configuration to build (ie Debug/Release.) Click the Reload button to reload available configurations from the project file. Choose the SDK Version to build. Supported SDKs are 1.0 and 1.1. For newer Framework versions, use the MSBuild Project action.